John Joyce, 1784 (ca. )-1808 and Peter Matthias, ca. 1782-1808 Confession of John Joyce, Alias Davis, Who Was Executed on Monday, the 14th of March, 1808. 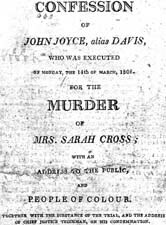 For the Murder of Mrs. Sarah Cross; With an Address to the Public and People of Colour. Together with the Substance of the Trial, and the Address of Chief Justice Tilghman, on His Condemnation. Confession of Peter Mathias, Alias Matthews, Who Was Executed on Monday, the 14th of March, 1808. For the Murder of Mrs. Sarah Cross; With an Address to the Public and People of Colour. Together with the Substance of the Trial, and the Address of Chief Justice Tilghman, on His Condemnation. Confession of John Joyce, Alias Davis, Who Was Executed on Monday, the 14th of March, 1808. For the Murder of Mrs. Sarah Cross; With an Address to the Public and People of Colour. Together with the Substance of the Trial, and the Address of Chief Justice Tilghman, on His Condemnation. Confession of Peter Mathias, Alias Matthews, Who Was Executed on Monday, the 14th of March, 1808. For the Murder of Mrs. Sarah Cross; With an Address to the Public and People of Colour. Together with the Substance of the Trial, and the Address of Chief Justice Tilghman, on His Condemnation. Philadelphia: Printed for the benefit of Bethel Church, 1808. Joyce, John, ca. 1784-1808 -- Trials, litigation, etc. Matthias, Peter, ca. 1782-1808 -- Trials, litigation, etc. Cornell Law School Library provided the text for the electronic publication of this title.